He noted that 50 per cent of those of concern to UNHCR last year were hosted in OIC member countries. That amounted to more than 17 million people, comprising refugees, asylum-seekers, returnees, internally displaced people and the stateless. Mr. Guterres also drew attention to a regional solutions strategy agreed between the Islamic republics of Afghanistan, Iran and Pakistan and UNHCR to address the Afghan refugee situation as a recent success. (See our Blog for Film – “Do not Forget Afghan People” ). “Just as Afghanistan, Iran and Pakistan are forging a common vision and approach, there are other opportunities for a structured dialogue to promote solutions in other protracted refugee situations in the Muslim world.” See our Film for Blo – “Angelina Jolie in Afghanistan” . The High Commissioner also urged those OIC countries that have not already done so to accede to the 1951 UN Refugee Convention – which forms the legal foundation on which UNHCR’s work is based – and its 1967 Protocol. The Convention, adopted to resolve the refugee problem in Europe after the Second World War, provides a definition of who qualifies as a refugee – a person with a well-founded fear of being persecuted for reasons of race, religion, nationality, membership of a particular social group or political opinion – and spells out the rights and obligations between host countries and refugees. The Protocol removed a deadline and geographical restrictions from the Convention. 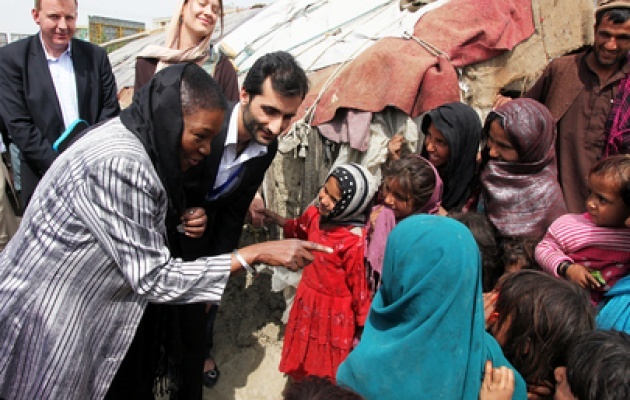 UN Photo - UN Humanitarian Chief Valerie Amos on recent visit to Refugee Camp in Kabul, Afghanistan.